Give your guests a chance to go beach combing without ever leaving their tables with these exceptional Shell Design Candle Wedding Favors. The perfect selection for a destination or beach themed wedding. Just like a real oyster shell, these exquisite open Shell Design Candle Wedding Favors have a treasure inside. But, here the treasure is a lovely tea light candle ready to glow. Each of these exclusive Shell Design Candle Wedding Favors measure 3” x 3” and are made with an iridescent white ceramic classic open oyster shell shape with a clear glass candle holder and poured white candle resting inside. Each elegant Shell Design Candle Wedding Favors comes stunningly packaged in an aqua blue box tied with a white satin bow and an attached matching heart shaped “For You” tag. Buy this now. These Sand and Shell Tealight Holder Wedding Favors are a great addition to any destination or beach themed event. Guests will enjoy lighting these Sand and Shell Tealight Holder Wedding Favors to enjoy memories of the shore. Each high quality, heavy glass is filled with authentic seashells and sand. 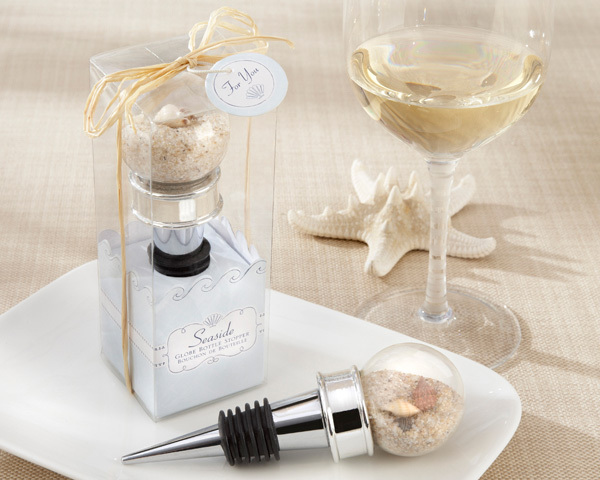 The tealight is included and each of these Sand and Shell Tealight Holder Wedding Favors are packaged perfectly as a gift with a rope ribbon and a beach theme hang tag that reads “Thank you for sharing this Day”. Sand and Shell Tealight Holder Wedding Favor measures 3.25″ x 3.5″. Buy this now. 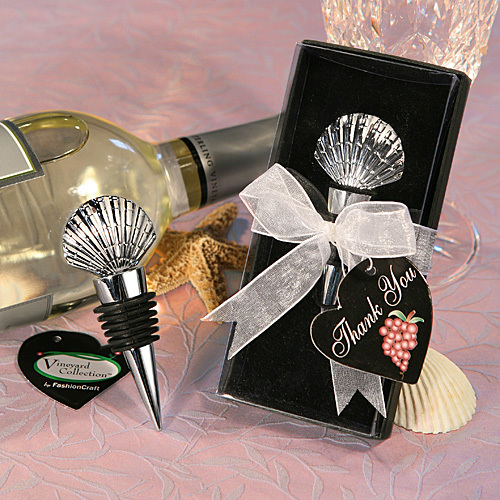 Give your guests a sparkling reminder of your day at the beach with these Choice Crystal Clamshell Wedding Favors. Your friends and family are sure to feel like they’ve discovered treasure when they arrive at your destination or beach themed event and find these exclusive Choice Crystal Clamshell Wedding Favors. Fitting for just about any occasion, each of these brilliant multifaceted Crystal Clamshell Wedding Favors measure 1 ¼” x 1 ¾” and resembles a clamshell opening to reveal a lovely pearl inside. These favours make for a stunning presentation surrounded by white satin inside a Choice Crystal signature blue heart design box, wrapped with an organza and satin bow with a heart rhinestone accent on top and an attached matching heart shaped “For You” tag. Buy this now. are a must. 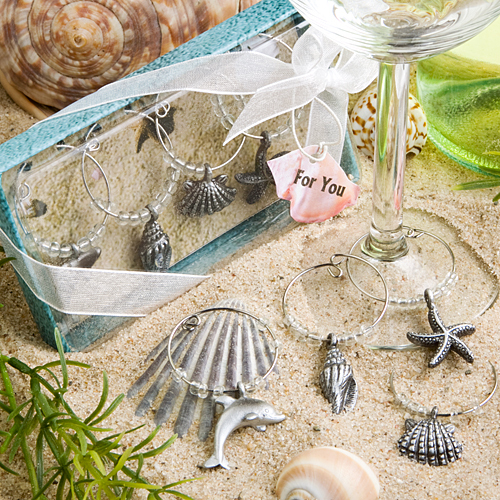 Included in the set are four beach-themed wine charms each depicting different treasures from the sea including shells and more. These charming favour sets come attractively packaged in a matching beach themed deluxe gift box tied with a white organza bow and finished with a sea shell-shaped for you tag. 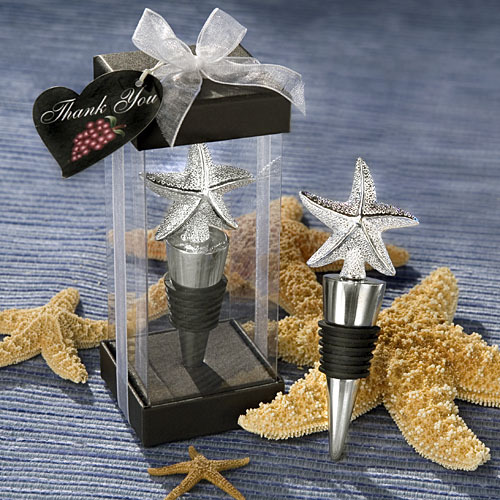 These wedding favors of unique Beach Themed Wine Charms make the perfect destination getaway gift. Buy these now.